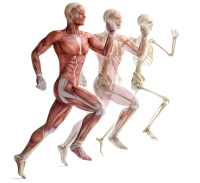 The solid framework that supports the body is called the skeleton. The bones of the skeleton work as anchor plates and levels to allow a person to move. Bones also play an important role in other body systems. For example, blood cells develop in the fatty inner tissue (red marrow) of bones. Bones are a type of connective tissue which is as strong as steel but extremely light. This tissue is made up of specialized cells and protein fibers. Bone constantly breaks down and rebuilds itself. The adult human body has 206 bones. The bones in the arms are the most commonly broken bones, accounting for almost half of all adult broken bones. In children, the collarbone is the most common broken bone. Bones are made up of calcium, sodium, phosphorous and other minerals, as well as a protein called collagen. Bones stop growing in length during puberty; however, bone strength and density change over the course of one's lifetime. Not only do bones allow body parts to move and function as the human skeleton, they also serve to protect organs from the damage of impacts. The human foot contains 26 bones. The hand contains 54 bones. The longest and strongest bone of the body is the thighbone, called a femur. The smallest and lightest bone is called the stapes and is located in the middle ear. The only bone not connected to another bone is the hyoid, which is a V-shaped bone located at the base of the tongue. The central shaft of long bones contain a medullary canal or marrow cavity. This cavity contains red bone marrow, which produces blood cells; yellow marrow, which is mainly fatty tissue; and blood vessels. Bone tissue is made up of protein fibers and specialized cells, which are woven into a matrix of water, mineral salts and other substances. Even when the body sleeps, the body's muscular system is never still. Breathing continues, the heart beats, the intestines move and the skeletal muscles occasionally contract, shifting the body into a new position. Most of the body's movements are the result of many different muscle contractions. For instance, a smile involves the teamwork of 20 separate facial muscles and the act of writing utilizes more than 60 muscles in the wrist, hand and arm. Muscles work in pairs. When one contracts to pull on a bone and start movement, an opposing muscle relaxes. Thus, body action is a continuing orchestration of simultaneous give-and-take movements. The brain is provided with information about the position and posture of the limbs through sensory systems built into muscles. This is called the proprioceptive sense, which allows humans to 'know" what the body is doing without having to first look. When humans are learning a new motor skill we concentrate on the movement as the brain attempts to adjust muscle control through a trial and error process. When muscles or bones are under excessive stress, the nerves send messages to the brain to register pain or discomfort. This awareness of pain stimulates protective or evasive action to avoid the pain or discomfort. Nerves end in sensory organs called spindle organs within the muscles. The nerves respond to tension by firing signals along the fibers in the nerves in order to tell the brain what is happening. The site at which two bones link is called an articulation or, more commonly, a joint. Joints are classified according to their structure and by the movements they allow. Synovial joints - These joints are the body's most numerous, versatile and freely moving. Synovial joints can perform well for decades if they are not over used. These joints are enclosed by a protective covering called a joint capsule. The inner lining of the capsule is called the synovial membrane, which produces synovial fluid that allows the joint to be lubricated, letting it slide against other joints with minimal wear and friction. Approximately 230 synovial joints are found in the body. Semimovable and fixed joints - Some joints do not allow a wide range of movement. They allow for growth or greater stability. These joints usually have bones linked by tough fibers or cartilage made of substances such as the protein which is known as collagen. In the skull, once growth is complete, the separate plates of bone become securely connected by interlocking fibrous tissue, forming suture joints. Fixed joints - An adult skull's suture joints are seen as wiggling lines. When the body is in infancy, these joints are loosely attached to allow the brain to expand. Semimovable joints - In partially flexible joints, the bones are linked by fibrous tissue or cartilage, as in the pubic symphysis. Ball and socket joints - The hip and shoulder joints are considered to be ball-and-socket joints and are the most mobile. Ellipsoidal joint - The base of the index finger contains an ellipsoidal joint, allowing bending and extending of the finger. Gliding joints - These joints are found between flat bones which are held together by ligaments, such as some of the bones in the wrists and ankles. Hinge joints - The knees and elbows contain hinged joints, enabling movement similar to the way a door hinge moves. Pivot joints - The joint in the neck is a pivot joint, allowing the head to turn from side to side. Arthritis literally means "joint inflammation". According to the Arthritis Foundation, there are more than 100 different diseases that produce joint pain and inflammation - everything from the flu to certain cancers. But when people say "arthritis", they usually mean osteoarthritis. Many illnesses cause pain and fatigue for a few days or weeks, but with fibromyalgia, chronic fatigue syndrome, and chronic pain, the symptoms last far longer and are less responsive to treatment. Fibromyalgia is pain and stiffness in 11 to 18 specific tender points of soft tissue throughout the body that last for at least three months. Initially, fibromyalgia was thought to be a psychological illness, but in 1990 the American College of Rheumatology finally recognized it as a physical disease and announced how to diagnose it. Still, however, some physicians do not believe that fibromyalgia is anything more than a mental issue, and do not diagnose it. Gout is an inflammatory condition that is caused by the de­posit of urate crystals in joints (most famously the big toe) as well as other tissues. Typically, attacks of fierce pain, redness, swelling, and heat punctuate pain-free intervals. Gout usually occurs in the big toes of individuals, but may also occur in the ankles, knees, wrists, and hands. Gout is most common in men who are middle-aged and older, but it also affects women. About one-fifth of people with gout develop kidney damage. Acute neck pain is when the neck spasms, often for what seems like no reason. Neck pain that lasts for more than a couple of months and returns on regular basis is considered chronic neck pain. Often, no medical issue can be found which is causing the pain, though newer technology can identify problems due to soft tissue. Osteoporosis, a leading cause of bone fractures, is a metabolic disease in which the structure of bone tissue breaks down, leaving bones thin and brittle. As part of the natural life-cycle of bone, old bone tissue is continuously being reabsorbed and new bone is forming. Until about age 30, bone mass increases because new bone forms faster than old bone breaks down. After 30, the rate of new bone forma­tion gradually declines, leading to overall loss of bone mass. Pain in a shoulder, elbow, knee or other joint can be a sign of tendonitis or bursitis. Tendonitis is an inflammation of or small tear in a tendon — the fibrous tissue that connects muscles to bones. Common sites of tendonitis include the Achilles tendon in the ankle and the rotator cuff in the shoulder, as well as in the elbow, knee and wrist. Bursitis is an inflammation of the bursa - sacs of fluid around a joint that cushion the muscle, bone and ligaments from friction when the joint moves. Bursitis is most likely to affect the shoulder, elbow, hip or knee. Literally meaning "grave muscle weakness" in Latin and Greek, myasthenia gravis is a chronic autoimmune neuromusuclar disease characterized by varying degrees of weakness in the skeletal, or voluntary, muscles of the body. When bones receive more pressure than they can withstand, a fracture occurs. Some of the more common causes are falls, car accidents and sports injuries.